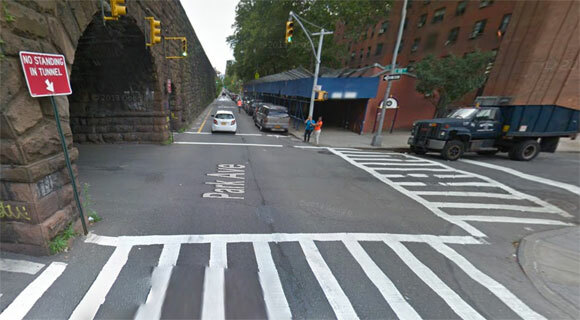 DOT will consider design changes at the Park Avenue intersection in East Harlem where drivers have recently killed three cyclists, but there are no plans for new bike infrastructure along the Park Avenue viaduct. Livery cab driver Nojeem Odunfa hit cyclist Jerrison Garcia at Park Avenue and E. 108th Street Monday morning, reportedly dragging Garcia 80 feet before stopping. Odunfa was charged with aggravated unlicensed operation and careless driving. Park Avenue is divided by a Metro-North viaduct from E. 102nd Street northward. There is car parking on northbound and southbound Park along this 30-block stretch, but no bike lanes. Cyclists on Park must share one through-lane with moving vehicles, and riding on Park or biking across Park entails negotiating intersections with limited visibility. It’s no secret that this segment of Park Avenue is dangerous for people on bikes. Garcia was the third cyclist killed at the E. 108th Street intersection since 2012. There were six additional crashes resulting in cyclist injuries on Park between E. 106th and E. 110th Streets from April to September 2013, according to I Quant NY. Data mapped by Transportation Alternatives’ CrashStat show dozens of cyclist injuries along the viaduct, and one death, from 1995 to 2007. The viaduct area is also hazardous for pedestrians, and a DOT project to make it safer to walk there is underway. In light of recent cyclist deaths and injuries, on Monday we asked DOT if the agency is reviewing conditions at Park and E. 108th, and if bike infrastructure improvements along the viaduct are in the works. While the 108th Street intersection concrete island is scheduled for implementation in the second phase next year, DOT is taking a look to see if there are any potential safety treatments that can be added. DOT also noted new bike lanes on E. 106th Street, which run from Central Park to First Avenue. New concrete and markings will force Park Avenue motorists to be more attentive, and will probably slow them down some. But as with DOT’s West End Avenue project, there are no provisions specifically aimed at making it safer to bike. As for enforcement, NYPD’s 23rd and 25th Precincts, which encompass Park Avenue north of 102nd Street, ticketed just 194 drivers for speeding combined through July — a little less than one ticket per day, on average. “Safety is DOT’s top priority”. Sweet! So they’re going to remove the parking and replace it with a physically-protected bike lane? No? Okay, so again (this isn’t the first time I’ve gone on this rant), it would appear that parking is, indeed, the top priority, and they’ll make it as safe as they can within the limitations of preserving parking. Who is in charge at DOT? This response is like, ‘in response to a car crash, we will be extending the runways at LaGuardia Airport.’ wtf??? *Does not apply to bicyclists. Safety is obviously not DOT’s top priority, as evidenced by its behavior. A comprehensive comfortable cycling network is not coming. Sorry folks, DOT threw in the towel before the game even began. Three cyclists killed in three years, and DOT’s comments on safety improvements don’t even mention cyclists? This makes me so mad. Is Robert Moses back from the grave to run things over there? You better believe if there were 3 car collisions at the same intersection within such a short time frame – even if only causing property damage, there would be a major redesign in the works. “Safety is DOT’s top priority” LIES. Not rocking the boat too much is the top priority. Bike safety now takes a back seat to maintaining car capacity and parking EVERY SINGLE TIME. We even prioritize maintaining capacity for double-parking over bike safety! Thanks. I’m glad I’m not the only one whose blood boils when DOT says “safety is it’s top priority.” They’re full of it and if you’re ever written to them about a safety problem you can see first-hand just how disinterested they are. I don’t think Vision Zero is going to go very far. To do so, the city will need to reform parking to free up space for things like curb extensions, widened sidewalks, protected bike lanes, etc. DeBlasio is unlikely to do it. He’ll see taking away free parking spaces as an assault on those mythical real, hard-working New Yorkers. He won’t reform the city’s moronic parking placard system either. Most of these people belong to unions and he’ll want union endorsements for his re-election campaign. I think we’re looking at mainly weak design tweaks such as the plan for West End Avenue in Manhattan, and vague “we can all do better” awareness campaigns. Neither which will make NYC very much safer. And then people will say “see, those crazy Swedish ideas don’t work here! We tried them!” Except we really didn’t. The entrance to the tunnel needs a chicane coming out into the roadway making the cars move away from the tunnel, so that when a pedestrian walks out of the tunnel they don’t get a nasty surprise. Same thing needed near South Street by the FDR overpasses. THIS is what pedestrians “see” everyday when they exit the viaduct on 108th Street and Park Avenue. *Does not apply to pedestrians either. Policy still seems to be “Feel free to kill people with your car, as long as you’re sober and you *claim* it was accidental”. I voted for de Blasio for one primary reason: his vocal endorsement for Vision Zero. I don’t know why, it just makes my blood run cold that this lane of parked cars is apparently untouchable, on a dangerous, narrow, vital avenue where accommodating them puts New Yorkers in extreme danger. Double-deck the surface parking lot east of Park Ave between 107th and 108th, if maintaining a small number of subsidized municipal parking spaces is such a huge priority. For heaven’s sake, get a protected bike lane along here. Forget DOT. This is City Council Speaker Melissa Mark-Viverito’s district. She worked hard to win protected bike lanes on First and Second Avenue. People are getting killed here, has anyone spoken to her about this? DOT doesn’t need to pour expensive concrete here. It needs to use pruning shears. But it just doesn’t seem to care.